As it breathes new life to Clark, Pampanga, Filinvest Mimosa+ Leisure City has been changing and invigorating the business and leisure landscape in the north with a progressive redevelopment masterplan. Integral to this plan is its 3.6-hectare sustainable office campus—dubbed Workplus—set amidst lush greeneries that is conducive for both work and wellness. Being at the forefront of Filinvest Mimosa+’s vision to elevate the business industry in Clark, six office buildings are set to rise in Workplus within the next six years. Currently, two office buildings—called 1 Workplus and 2 Workplus—are already complete and ready to welcome corporations that are looking to expand their business in Central Luzon. This is another proof of the dynamism that Filinvest has been injecting into the Mimosa+ estate. “With the opening of Workplus, we aim to not only bring in more business to Clark, but to also help increase employment in Pampanga,” notes Filinvest Cyberzone’s first vice president Janette Cordero. With a total gross floor area of over 110,000 square meters and total gross leasable area of approximately 100,000 square meters, all Workplus buildings come equipped with fibre optic facilities that are best suited for business process outsourcing (BPO), information technology (IT), and knowledge-based companies, with ample surface and podium parking areas available. Furthermore, each structure strictly follows the green building guidelines of Clark Development Corporation to promote corporate social responsibility and true green living. Also of particular note is how the office campus is filled with full grown Acacia trees and rich flora. 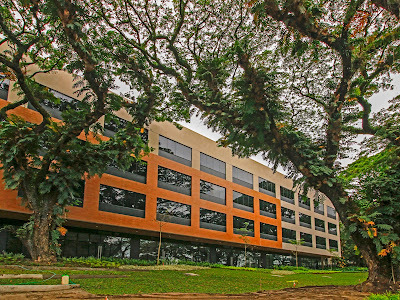 Cognizant of this, Filinvest Mimosa+ collaborated with renowned designer firm H1 Architecture to devise an office campus master plan that is conscious of the natural landscape, where the positioning of the buildings, for example, was carefully composed in such a way that it moves around and blends with the trees. This creates a healthy, vibrant atmosphere that seamlessly integrates the landscape with the buildings’ architectural design. Moreover, the building design features a "glass belt"—reflecting the landscape surrounding it from the outside—that breaks the volume and creates a sense of individuality in each of the buildings. Other factors that set Workplus apart are the leisure destinations within Filinvest Mimosa+—the Quest Hotel and Conference Center-Clark, which is currently undergoing renovations to better serve both short- and long-staying guests, and the 150-hectare Mimosa Golf Course, which is the centerpiece that draws a steady stream of guests to the estate. Filinvest Mimosa+ takes pride in a 201-hectare expanse of lush landscaping with an abundance of mature trees. Awarded with a long-term 50-year lease, the Filinvest Group continues to fulfill its plans of redeveloping the estate as it takes into account four major components: leisure, business, residential, and nature. In addition to the office campus, its vision includes a lifestyle mall and an al fresco retail strip, which will soon be home to various boutiques and unique dining concepts. Then, there’s the Events Grounds and an Events Pavillion for MICE (meetings, incentives, conferences, and events) and a residential phase that will offer the most beautiful countryside living spaces. With all these dynamic developments, together with the recent uptick in BPO property demand, Workplus in Filinvest Mimosa+ is well-poised to lead the growth charge in the north, anchored on the vision set forth by the Filinvest Group: an integrated, balanced, and eco-centric masterplanned community.